122 min. Universal Pictures. Director: Danny Boyle. Cast: Michael Fassbender, Kate Winslet, Katherine Waterston, Seth Rogen, Jeff Daniels. Here’s an idea…how about a movie about Apple co-founder and CEO Steve Jobs? I kid, of course. Since Jobs’ death four years ago, we have already had a traditional biopic (Jobs), starring Ashton Kutcher, and an Alex Gibney documentary (Steve Jobs: The Man in the Machine) focused on bad behavior. What, then, is a studio out to create another Steve Jobs movie—creatively titled Steve Jobs—to do? Hire a screenwriter who won an Oscar for portraying a tech giant’s rise (Aaron Sorkin of The Social Network, adapting Walter Isaacson’s authorized bio Steve Jobs), an Oscar-winning director (Slumdog Millionaire's Danny Boyle), and a top-shelf cast, including Michael Fassbender as the titular selfish, insecure sales genius, Kate Winslet as confidant Joanna Hoffman, Jeff Daniels as Apple’s CEO for a decade John Sculley, and Seth Rogen as inventive electronics engineer Steve “Woz” Wozniak. The result is a film with audiovisual punch, a snazzy structure, and dynamic delivery of Sorkin’s patented rat-a-tat-tat dialogue, but also a film that, in attempting to “pull back the curtain” on a man, reveals behind its own theatrical curtain nothing much worth paying attention to. Sorkin adopts a much-ballyhooed three-act structure to reveal Jobs’ character through his discussions preceding three key product launches: the 1984 Macintosh launch at Cupertino’s Flint Center, the 1988 NeXT Computer launch (which the film moves across the street from Davies Symphony Hall in San Francisco to the War Memorial Opera House), and the 1998 iMac launch (which the film relocates from Flint Center to Davies). Inexplicably, Sorkin squanders this promising approach not by laying in motifs so much as repeating himself, with each section forcing confrontations with the same key influences: Sculley (who, in fact, Jobs never spoke to after 1985), Woz, Hoffman and, most of all, Lisa Brennan (played by three young actresses), Jobs’ daughter with Chrisann Brennan (Katharine Waterston). As such, Steve Jobs has more cheap psychology than it knows what to do with, with the role of surrogate father played by Sculley and the role of Jiminy Cricket shared by Hoffmann (“What you make isn’t supposed to be the best part of you”) and Woz (“How come I read ten times a day Steve Jobs is a genius?”), with Lisa as the daughter that Jobs denied, largely failed, but ultimately took great pride in. The actors are all fine, although crucially Fassbender fails to capture Jobs’ impish-imperator essence, and he’s not helped by the artifice overload (and final, false-ringing uplift) that Sorkin and Boyle orchestrate. In one of the most “script-y” lines in a film full of them, device-launcher Jobs laments, “I’m poorly made.” That’s not exactly true of Steve Jobs, but this cinematic 3.0 remains buggy, a product that creates its own need—to pick bones clean— instead of filling our need to understand what made Jobs tick and his products so alluring. 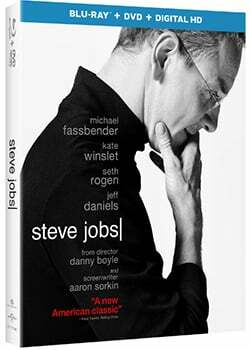 Universal Home Video debuts Steve Jobs in a Blu-ray + DVD + Digital HD special edition with sterling A/V specs and a near-definitive set of bonus features (lacking only deleted scenes). The HD transfer comprises three different sources/aesthetics: 16mm, 35mm, and hi-def digital video. It's hard to imagine any of the discrete sections looking better in 1080p than they do here. Obviously, the digital section provides the sharpest image, with the 35mm section and 16mm sections looking more and most filmlike in comparison, with thicker and thickest grain structures, the limitations of each source becoming virtues in distinguishing the film's episodes. Each section maximizes its source, with visual character attendant to that type of film; range of color is deeper in the 35mm and digital sections, and black level stands out particularly in the 35mm section, but I have no complaints with Universal's transfer; it's a beaut. Similarly, the lossless DTS-HD Master Audio 5.1 mix does its job well,with LFE engaged in the stomping of the crowd, music showing nice dynamic range, and subtle ambience participating enough to be noticed in the somewhat immersive surround soundfield. The disc includes two audio commentaries, the first with director Danny Boyle and the second with screenwriter Aaron Sorkin and editor Elliot Graham. The first, attentively screen-specific track finds Boyle enthusing about the approach to the material by himself and Sorkin, production details, the work of and with the actors, and so on; intriguingly, Boyle refers to deleted scenes he hopes will be included but which, alas, are not. That may be due to budget concerns for compensating actors, the actors' wishes, or perhaps those of Sorkin, who takes the gregarious lead in the solid second commentary track; some gaps make this one a bit more for completists, but Sorkin is always an interesting cat, and engages in explanation (and perhaps defense) of his script as it relates to reality and functions as drama, with Graham a welcome participant with the largely neglected insight of the film editor. The three-part documentary "Inside Jobs: The Making of Steve Jobs" (44:11, HD) comprises "Part One" (16:18, HD), with its focus on Jobs and his portrayer Michael Fassbender, Sorkin's scripting and adaptation of the Walter Isaacson book, departures from the real-life facts, and Boyle's work as director; "Part Two" (14:50, HD) with its overview of supporting characters and actors and how the ensemble gelled in rehearsal; and "Part Three" (13:03, HD) with its examination of production in significant San Francisco Bay Area locations, as well as scoring the film. All site content © 2000-2019 Peter Canavese. Page generated at 04/25/2019 02:38:51PM.